Most bike shops go an extra mile to help their customers choose the right bike and frame size, but it does no harm for you to be knowledgeable in what you should look for before you start the purchase process. This guide will help you choose a bike that not only fits correctly but also one that gives you comfort and a good grip for longer rides. Mountain bikes come in different sizes and shapes targeting the variety of customer tastes and preferences. Therefore, the best starting point is in knowing the constituent parts of a mountain bike so that you can comfortably interact with any information touching on those parts. Mountain bikes ride and feel differently even when their numbers vary slightly from paper. Manufacturers make an effort to list the various frame sizes to make it easier for you to choose the right frame. However, these frame sizes can at times be confusing especially to the beginner who simply wants the question, what size mountain bike do I need? answered. According to experts, the two most important considerations when choosing the right frame sizing should be the top tube length and that of the seat tube. The seat tube ought to leave you with a good stand over clearance and a sufficient stand over gap. To get this, mount the bike and while there, stand back as far as you can while ensuring there is, at least, an inch of room from your crotch area to the top tube. If you carefully follow these instructions, then your frame ought to provide you with a slightly larger range of seat post adjustment which is very critical in finding your optimal saddle height. Together with the stem length, handlebar position, and seat position, the length of the top tube helps in defining the efficiency and comfort level your body will enjoy on the bike. The top tube length as we know it doesn’t have much influence, but rather an aspect of it known as the effective top tube. A horizontal line stretching from the middle of the seat post all the way to the head tube midpoint. Because of body variations and different riding styles, a wider handlebar can be an excellent choice. Because as the bar widens, it gives you more steering torque to maneuver through rough terrains. A handlebar change can pull you forward a little bit and make it easier for you to breath because it opens up your chest when going up a hill. Most shops can willingly assist you to change a bar width. If you are the kind of rider who has a slightly disproportionate leg to torso size, changing the stem length can give you a comfortable posture while riding. A longer stem pulls you forward and flattens your back. In turn, this slows your steering down and gives you more traction at the front wheel. On the other hand, shortening the stem moves you towards the center of the mountain bike and adds a little curvature to your back. It makes your riding position upright. When the stem length is measured and adjusted correctly, you are less likely to suffer upper body soreness while riding. In finding out the right frame size, experts say there is no single perfect solution. You can always adjust your stem, saddle and handlebar to get an excellent feel that works for you. However, the manufacturers’ guidelines come with suggested height range to match each bike frame size. Below are suggestions you may come across. XS: The bikes measure 13 to 14 inches in size for riders from 5ft -5ft 4in height. When looking for a conclusive answer to the question, what size mountain bike do I need? One important thing you have to bear in mind is that giant breed and cyclo-cross bike sizes are about 3 to 4 inches bigger for riders measuring the same height. Let this not confuse you when looking through bike size listings. There are dangers in choosing a frame size that is larger than you can handle. It could make you suffer a sore back resulting from overreaching particularly on long rides. 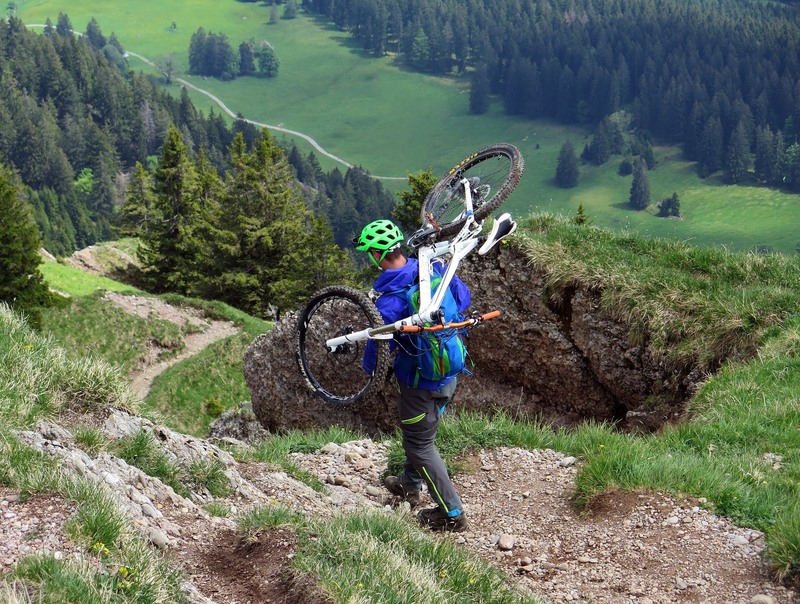 Also, the lack of stand-over clearance can cause some wince-inducing experiences and a general lack of control on your mountain bike. On the other hand, a smaller frame can cause injuries because they cramp your position, particularly on longer rides. Toe overlap problems also occur as a result of your foot clipping the front wheel. Smaller frame sizes also give you too much clearance which can potentially cause back problems on longer rides. Therefore, the answer to the question, what size mountain bike frame do I need? Depends largely on how you feel when you ride. Where possible, try out different frame sizes on demo rides before committing to purchase.